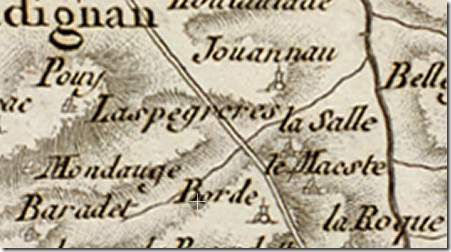 Laspeyrères is a 72ha (177 acre) beef farm in the Gers. It has been around a while – the main farmhouse is old and the farm name shows up on the carte de Cassini made between 1756 and 1789. Presumably it is much older than that since folks have been farming out here for thousands of years. Laspeyrères is old Gascon for The Rocks since the farmhouse is built on a rocky intrusion with the limestone walls sitting directly on limestone bedrock. 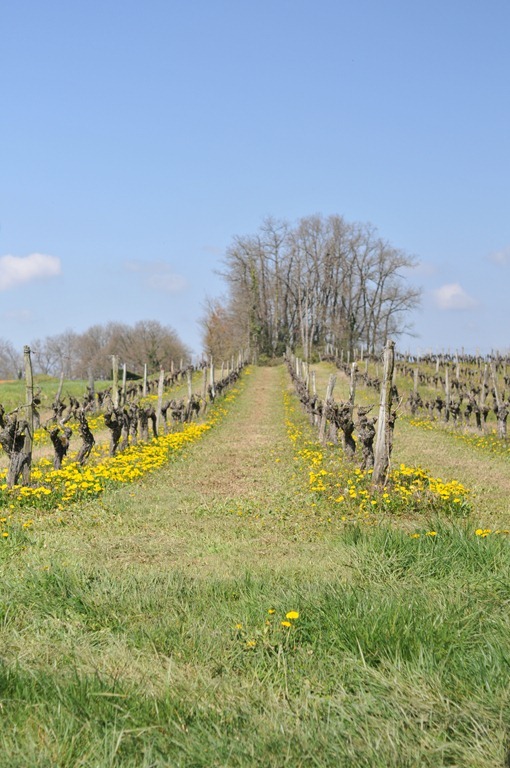 Like a lot of old Gascon farms it used to be split three ways – vines, cereals and cows. Every thirty years the vines would move to a new area and the old vineland would become cereal land or pasture for a while. We have some old aerial photographs on the wall that show the farm about forty years ago with vineyards in places where there are now pastures, but the echo of the vines is still there in shallow undulations in the soil that you feel if you drive across them. We’ve removed the few hectares of old vines that were no longer productive and converted the land into a mixed grass and lucerne pasture. We’re focusing on beef cattle since that’s what we think Southwest France needs. The soils here are limestone based from an old sea bed that lies underground. The ground water is very high in calcium and the soils themselves are rich in calcium, phosphorus and potassium and make an excellent base for pasture. We dug holes under the vineyards and saw the soil go to 60-80cm in depth. The pH is a natural 7, does not need liming and grows lucerne very well. Very informative, but some rather important things are missing. Where can I buy your meat?Where can I see a list of what you sell with prices attached so I can make an informed decision as to what to buy from you? Hello Frie. Thanks for your questions, they inspired me to put together a quick list of information for you at https://grasspunk.com/how-to-buy-beef/. In short we are near Condom in the Gers. You reserve a box of beef from the next sale then on the beef day you come to the farm and get your beef. We sell boxes of mixed cuts with a range from the whole cow. Sometimes we sell boxes of minced beef in little steak haché packets. If you are near enough you drop by and get a sample. Could I order a box of 5 Kgs of mince for this coming Friday for us to try out your beef? Please let me know exactly where you are and what time would be convenient for us to come to see you. hi brent. i recently purchased a small farm on bainbridge island, washington and am raising some sheep, pigs and chickens. i am keen to improve my pastures for grazing- right now they contain a great deal of moss and limited grass. i was wondering if you could turn me on to some resources that would instruct me how to improve my pastures? i have been following your blog for several years with great delight. how can i make my pastures look like yours!? thanks! Hello Jamie, related to Brian Fleming of Suckerpunch by any chance? We don’t run sheep or pigs but some things would be common between the two farms. You could learn what your soils are made of, their pH and so on. Soil tests are relatively cheap. Mine are limestone clay/silt so have a pH of about 7 which makes things easy. There might be something obvious that jumps out at you. We had a lot of moss here before, which usually means acidity so when you find moss on neutral soils like mine it is more likely a symptom of overgrazing and low fertility. We fixed this by running a rotational grazing system giving the pasture a lot of rest between grazes. Right now those mossy pastures are very good but it has taken over three years to get that way. We stopped the overgrazing that the pastures used to get. Trampling in a lot of taller grass has fed the worms and the bugs and upped the soil carbon. All this has improved soil fertility. 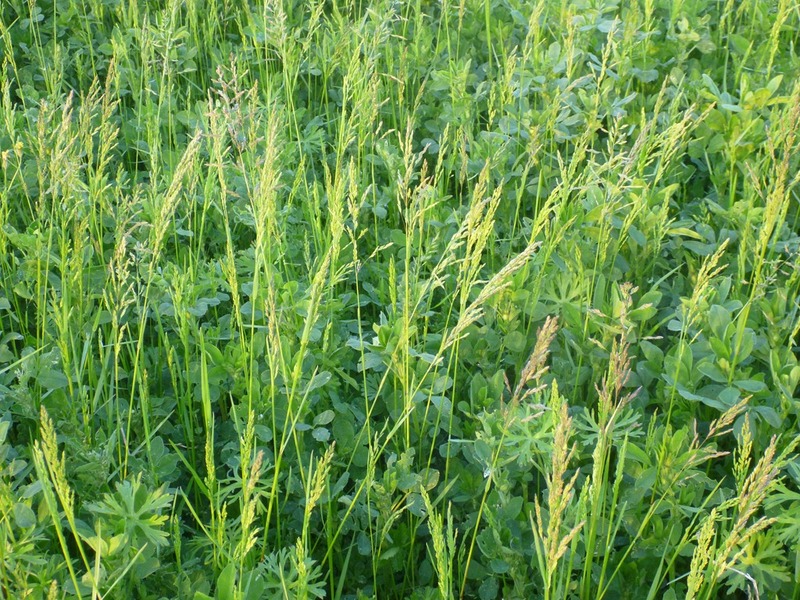 Legumes have got way better and now the grass is doing very well. Maybe buy some cheap old hay from some other farmer on the island and feed it on poor spots? There’s a school of thought that says to always buy hay since it contains a lot of extra value in minerals and carbon that isn’t factored into the price. Don’t forget it is a bit difficult to compare pastures because of climate. It is warmer here than Bainbridge so when you are at the start of spring we’re in full growth mode. If you compare pastures in August we’d look awful compared to yours since we’re usually in a drought feeding hay and Bainbridge is beautiful at that time. For your farm it is hard to say without knowing more about it, but I imagine you could built a lot of fertility by moving the chickens to put in their manure around the farm (like Salatins chicken tractors and eggmobile) and rotationally grazing the flock of sheep. Pigs would be good to clean up rough ground. I’d look at NZ information. The climate is similar to Western Washington (as a NZ-born Seattleite I know) and they know their sheep in New Zealand. For sheer enjoyment I suggest A.G. Street’s Farmer’s Glory and George Henderson’s Farming Ladder since they are beautifully written snapshots of old farming and there’s a lot to learn there, but there aren’t a lot of sheep in them, although Henderson’s short time on a Scottish sheep farm was an amazing read. Newman Turner is good too, but again likes his cows. small world! brian fleming and i were just in washington dc together for a week. our kids are at the same school and we chaperoned the 5th grade class on a tour of the capital. how do you know brian? i didn’t realize you had kiwi roots- my parents live in alexandra, nz for the southern hemisphere summers and live here in the pacific nw for our summers. we love nz. thanks for your feedback on improving soils and grass. i’m going to check out the books you recommended. i grew up in wyoming and we raised a band of sheep in the bighorn mountains, but this is my first foray into animal husbandry in my adult life. the climate and soils here are a totally different beast, so i am starting from scratch in my knowledge base. you have clearly done a beautiful job improving your land. nicely done. you are a great inspiration to me! thanks brent. i’ll keep you posted.